The village of Mellieha in Malta is very popular with locals and tourists. During your stay in the Mellieha area you should find time to visit important locations. The small village of Mellieha stands on the north-west part of Malta. Lying at an elevation of 150 metres above sea level gives it an imposing position. It lies at the edge of several cliff edges giving it a magnificent panoramic view of the north tip of the island. Overlooking the sandy beach of Ghadira Bay just down hill from the village centre. Paradise Bay, Golden Bay, Armier Bay are the other beaches which attract so many visitors for swimming lying around in the vicinity. Cirkewwa port is the ultimate destination for those who wish to visit the island of Gozo with the ferry boats with continous crossings all through the week. The location has become most attractive to tourists due to its location and its beautiful country side and not least to locals. It has become a summer resort with prestigious high standard hotels and numerous apartments within the village core and surrounds. The area is surrounded with plenty of fresh and clean air and natural environment. Many foreigners have bought a proper and have lived here for many years especially at the Santa Maria Estate with prestigious expensive villas. Not the least it is also a destination for local and tourist to come here for restaurants and fine foods. For those who come here for a holiday a variety of shops, mini markets, souvenir shops are available especially within the centre of the village. The community is just over 10,000 where it has spread in new areas around like Santa Maria Estate. Other areas have developed namely Ta’ Penellu, Mellieha Heights, Ta Masrija and Tal-Ibragg. 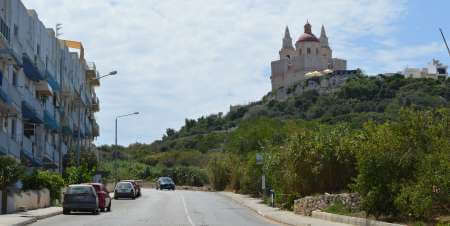 The small villages of Selmun and Manikata form part of the Mellieha local council. Mellieha is derived from the word salt in the Arabic language dates back to the Punic and Roman periods. The first inhabitants arrived here from the nearest island of Sicily around 8000 BC. They were surely attracted by the landscape features, like abundance of natural large caves located at high levels, sheltered areas, hills and valleys with fertile soil and natural water springs. The abundance of pieces of pottery is an indication to this. The Mellieha contains various beaches which were used for landing, this enabled many corsair and pirate ships which enabled them to land and attack the Mellieha residents for many centuries. This brought a lot of suffering the the community and for long periods the locality was abandoned. When the knights where in Malta this problem persisted. At a certain point a decision was taken to build the first fortification which was the Red Tower. It was completed in 1649 to instill fear in the enemy and create feelings of security amongst the locals and we the beginning of a new era. Later on, the Knights of St. John decided to start fortifying the long coastline especially the beaches with coastal batteries redoubts and entrenchments with batteries. Some of these are the White Tower 1658 then a battery was constructed around it 1715. Thus they built the Vendome Artillery Battery 1714-1716, Mistra Artillery Battery around 1761, Wied Musa Battery 1714-1716, and Westreme Artillery Battery 1714-1716. Today it is used by the local council as the Tunnara Museum. These fortifications helping to rebuild the confidence of the population. Development during the British era when the administrators started leasing land for agricultural land for development to encourage them to live here. From this time onwards it continued to flourish. By this time there were no more attacks from the shores, time had changed. During World War I Mellieħa played an important part in providing convalescence centres for many Allied wounded soldiers from the Salonica and Gallipoli Campaigns. 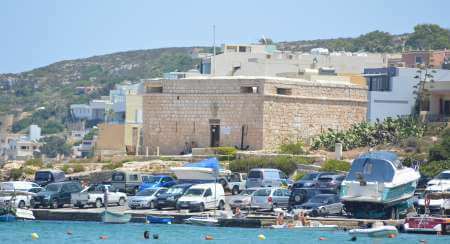 At the Għadira bay there was a Military Hospital housed about 2000 such casualties whilst Marfa Palace provided a recreational centre for them. Today there buildings were dropped down and instead the Mellieha Holiday Centre was built. Due to the many British soldiers and anti aircraft placement in the Mellieha area, this location was frequently bombed. A total of 46 air-raid shelters were dug up in the rock for the local population to shelter from aircraft bombing. Today two of them have been reopened to the public close to the Sanctuary of Our Lady. They are open to the public from Monday to Saturday from 9.00 to 15.30. There is an entrance fee of 3.00 Euro. The church is very visible from all over the area as it is built on the edge of the cliff apart from its massive structure. It is dedicated to the Nativity of the Virgin Mary was built between 1881 and 1898. Over these 14 years of hard voluntary work. The previous parish church was the Sanctuary of Our Lady but due to the increase in the population a new church was needed. The village feast is celebrated on the 8th of September. 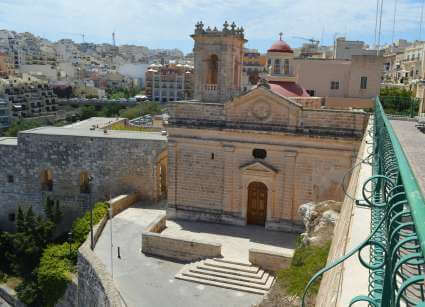 This parish was one of the first 10 distinct churches in Malta mentioned in the document of 1436 prepared by Bishop Senator De Mello. When the locality was no longer inhabited due to corsair attack it was no longer mentioned. Became again in 1844. It was blessed in 1897 but still had no belfry. First stone was laid on 5th September 1883 and when completed it was consecrated by Bishop Mauro Caruana on 18th February 1930. 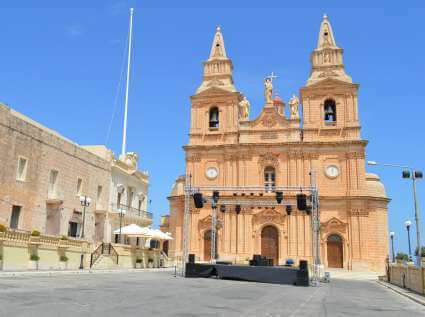 It is worth visiting the parish church as it contains various architectural works like sculptures, statues and paintings which were undertaken over many years by Maltese artists and donated by local benefactors. Initially many centuries ago this was a grotto in the natural rock formation. The local population had a great devotion to Our Lady which statue was located in this grotto. All this fear was generated from the ever present fear of attacks from corsairs from the many beaches in the Mellieha area. The devotion flourished and there was the need to build a church from the donation and hard works of the population. Presently this sanctuary, which was previously the parish church is now full of relics brought over by many people who have acquired protection or graces for the Virgin Mary. It is worth visiting and if you wish to find peace of mind do come here for a while. Today it is dedicated to the Nativity of the Virgin Mary. Many people from around the world come purposely here where today it is listed as one of 20 National European Shrines forming part of the European Marian Network based in Lourdes, France. 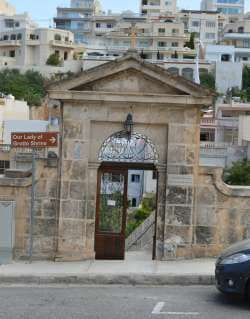 Opposite the sanctuary church, on the other side of the main road leading to Ghadira Bay, there is a natural cave lying low in the valley where there are steps to go down to it dedicated to Our lady. It has been a special place for many centuries. Up till today it is still lit by the many votive candle light offerings in an act of Christina prayer. They are brought over by the parishioners and other coming from various villages. It is full of relics brought over by people who suffered an illness and were healed. A spring of running water lies under the stature of our lady.